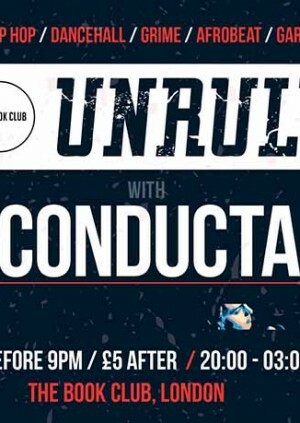 UNRULY is back at The Book Club on Saturday 2nd March and we are bring Conducta to the decks! Conducta started making his own music at 15, teaching himself production, keys and guitar, with an early demo played by MistaJam on BBC Radio 1xtra. In 2012 he released his first full single, ’Change My World’, and started to be appear on line ups regularly up and down the country – catching the attention of garage legends such as DJ EZ, Tuff Jam, MJ Cole, Craig David and Artful Dodger. As well as his own productions, Conducta has built a flawless reputation as a remixer, with official remixes for J Hus, MoStack, Jorja Smith, Cadenza, Ray BLK, Goldlink, Skrillex and more over the last few years, with his versions of the track often doing higher streaming numbers than the originals.